... Simple Elegance. Air, Rain and Windproof. What is the Giemme System? Bars and pubs have taken on an increasingly important role in recent years as meeting points where people choose to chat and relax. By now the “happy hour” after work or the “aperitif” in tourist areas have become fashionable. Often the trendy bars are the hub of social activity and as a result they become true symbols for various locations. This context goes hand in hand with the Giemme System since the total transparency permits you to see from the outside, those already inside the room. It’s an invitation to enter. 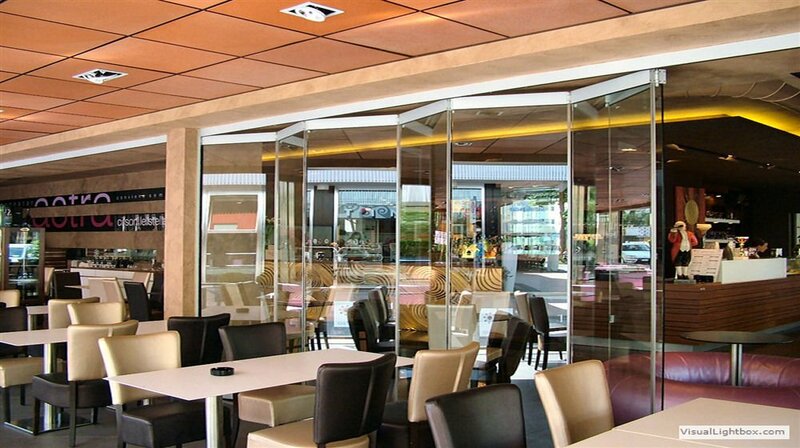 The absence of boundaries between inside and outside permits you to use the room in a different way by perhaps eating at the bar and then taking a couple of steps on the threshold of the premise. Meanwhile you can sit comfortably whilst waiting for friends at any time of year with full visibility whilst the gazebo or veranda is closed. 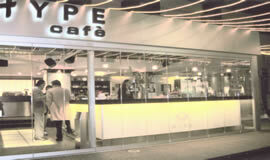 A look of total transparency was created by closing off the outside space in Hype Bar in Milano Marittima. Enclosed by the Giemme System on 3 sides, it creates a particular scene especially at night-time when light from inside reflects onto the glass outside. 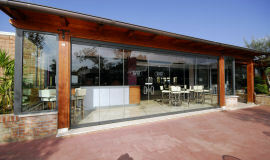 Among the latest creations are the elegant Steel Bar in Termoli and the highly popular Astra Bar in Bibione. 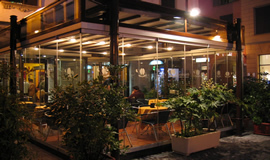 The crowded Greek Café on Lake Como was able to make use of the street space in front of the bar by creating an outdoor gazebo. It was constructed with an iron frame at the entrance and the GIEMME SYSTEM was used for the 3 perimeter walls. Not to be forgotten is the public bathing area Bagni Kursaal, on the Porto San Giorgio seafront (Fermo, Marche). Here, even when the sea wind becomes excessive, the premises can still be used by simply closing and locking the folding glass doors. Glass doors folding up to the side, without an entrance door. Doors fold up to the mounted side. Also available without floor guide rail up to a maximum of 4 doors. Can be opened internally or externally. With hinged entrance door. Doors fold up to the opposite side. Glass doors fold up to the mounted side. Also available without a floor guide rail up to a maximum of 4 doors. Entrance door with lock, handle and closer. Can be opened internally or externally. With hinged entrance door. Doors fold up also to the door side. Doors can be folded up to the mounted side or the door side. Only available with a recessed floor guide rail. Entrance door with lock, handle and door closer. Can be opened internally or externally. The best results can only be achieved with the best technology. GM Morando's products are easy to use thanks to the constant development of new technology. ©2009 GM Morando srl - VAT number 04017290968 - GIEMME SYSTEM is the registered trademark of GM Morando Srl. - Reproduction is prohibited.